For mass timber, specification of appearance grade varies by product. Aesthetic expectations for cross-laminated timber (CLT) and nail-laminated timber (NLT) are agreed upon between the building designer and manufacturer/fabricator and described in the product specifications, whereas grades for glued-laminated timber (glulam) are standardized. This appendix contains examples of CLT appearance classifications for reference only. These requirements are based on the appearance at the time of manufacturing. The actual CLT panel appearance requirements are recommended to be agreed upon between the buyer and the seller. In exposed surfaces, all knot holes and voids measuring over 3/4 in. (19 mm) are filled with a wood-tone filler or clear wood inserts selected for similarity with the grain and color of the adjacent wood. The face layers exposed to view are free of loose knots and open knot holes are filled. Knot holes do not exceed 3/4 in. (19 mm) when measured in the direction of the lamination length with the exception that a void may be longer than 3/4 in. (19 mm) if its area is not greater than 1/2 in.2 (323 mm2). Voids greater than 1/16 in. (1.6 mm) wide created by edge joints appearing on the face layers exposed to view are filled. Exposed surfaces are surfaced smooth with no misses permitted. Voids appearing on the edges of laminations need not be filled. Loose knots and knot holes appearing on the face layers exposed to view are not filled. Members are surfaced on face layers only and the appearance requirements apply only to these layers. Occasional misses, low laminations or wane (limited to the lumber grade) are permitted on the surface layers and are not limited in length. Several CLT manufacturers provide documents outlining appearance grade options for the products they produce. See this link for one example. 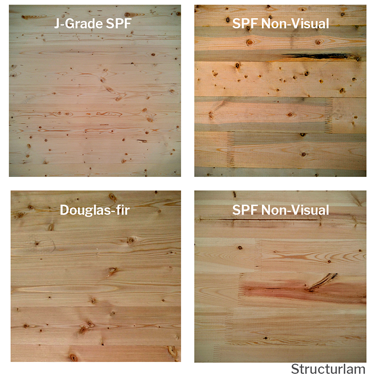 In Europe, terms such as WSI, ISI and NSI also relate to CLT appearance grades. However, they are rarely if ever used by North American manufacturers. See this document for an explanation of these and other common appearance terms for European CLT. Since NLT does not have a recognized standard for production, it is up to the design team (usually the architect) to note requirements for appearance and quality of panels. As with CLT, this information is typically included in the project specifications. See Section 2.1.2 of the NLT Guide for additional information and panel examples, which are helpful for establishing acceptable and unacceptable aesthetic characteristics. Appearance charts can be found in Appendix A.
Glulam is manufactured to various appearance classifications—including Premium, Architectural, Industrial and Framing—for structural and architectural applications. These classifications distinguish various levels of natural growth and manufacturing characteristics that are visible on the glulam surfaces. They do not characterize or affect structural performance. Of these classifications, Premium and Architectural are used in applications where the member may be exposed and finishing may be desirable. Premium is usually specified where appearance is the primary design consideration; however, it is usually a custom order. Architectural grade is suitable for use in applications where appearance is important but not the main consideration. Several sub-categories, including Framing-L and Industrial-L are also available. These match their main appearance classifications with the exception that the outermost plies are laminated veneer lumber (LVL) rather than dimension lumber. Additional information regarding appearance classifications can be found in AITC 110-01: Standard Appearance Grades for Structural Glued Laminated Timber and in Chapter 13 of ANSI A190.1-07 American National Standard for Wood Products: Structural Glued Laminated Timber. Glulam is also available with either a smooth or a rough textured surface. Rough textured surfaces may require up to twice as much finish as smooth surfaces. For additional resources see the technical note: Glulam Appearance Classifications for Construction Applications from APA.